This is the answer a group of university students were given when they asked their professor if they could practise speaking English with her. She was a native speaker and they thought it would be an ideal opportunity to learn natural English. ➤ Years of paralysis – feeling incapable of stringing a sentence in English that wasn’t perfect. ➤ Years of feeling shame to open your mouth and make a grammar mistake, articulate a mixed-up sentence or use the wrong word. ➤ Years of feeling unworthy of speaking English. ➤ Years of feeling ‘not good enough’. And years obsessing about speaking. ➤ If only I could speak grammar-perfect English, I’d get a promotion in my company. ➤ If only I could get the correct sentence structure when I speak, I’d sound more professional when presenting my ideas to the management board. ➤ If only I could remember the right words, I’d impress my colleagues during that strategic negotiation. But the teachers in your past, who’ve now become your inner critic, keep reminding you that you’re not good enough to open your mouth and start speaking during that conference call. So you stay quiet and nurse your shame in silence. Chantal’s desire to speak English had been one of her top 3 items on her to-do list for the last 20 years. Every time she went to tackle this item, those ‘teacher voices’ would come back to haunt and remind her that she wasn’t good enough. So, she’d admit defeat and put the item back on her list and make a note to revisit it a few years later. This went on until 2 months ago when she was promoted to lead the international team ( in addition to her national team) at the bank. She was going to have 18 countries reporting to her in her role as Director of Financial Operations Cost Control! Not speaking English was and is NO LONGER an option for her. Time to seriously tackle item 3 of that to-do list. Chantal decided to spend a week with me on an intensive course to do just that. Her goal was to overcome her fear of speaking so that she could speak fluently and effortlessly with her international team during her conference calls. ➤ “not have to think before I speak” – in other words, no pauses. The trouble with this goal. The focus was on speaking NOT communicating. She needed to communicate if she was to successfully lead her team. However, before I could deal with this I had to help her overcome years of paralysing fear and shame of not speaking good English. 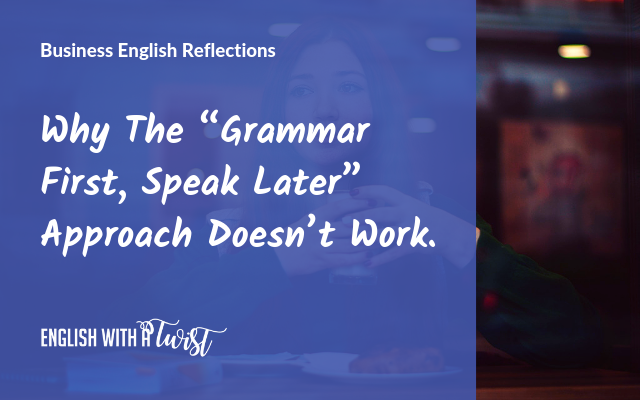 3 steps to conquer the shame of ‘not having enough grammar’. ➤ As the head of the international team, she needs to hold and lead regular conference calls with them in English. ➤ Her job is to help them make effective operational cost savings in their countries. This involves understanding their problems and offering solutions clearly and in plain English. ➤ the focus was NOT on speaking but on communicating her message to her team. ➤ that grammar mistakes would not only be accepted but be welcomed by her international team. What a relief! ➤ by beaming the spotlight on her audience through listening (communicating) and not just speaking, she was in control, she could relax and she could do her job more easily. ➤ she was promoted to the job despite her English skills because management has complete confidence in her abilities to lead and make significant, positive changes to the company’s profit margins. 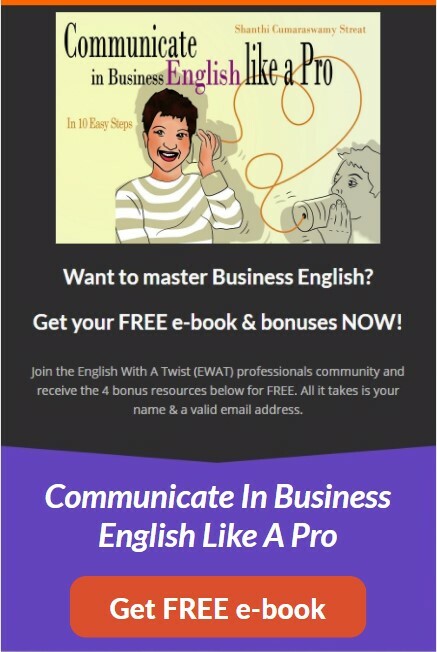 This wholehearted belief and trust in her competence and professionalism transcend any ‘bad’ English she may have and focus on what’s important – her expertise. No matter how fluent you are at speaking, how many words you use, how few mistakes you make, if your message is unclear you’re NOT communicating effectively. ➤ clearly identify the outcome you wish to accomplish before doing anything. All business communication is goal oriented. ➤ give your thoughts and ideas a structure that will help you achieve your outcome, including the words you want your listeners to hear, the order in which you want them to hear your ideas (cohesion + clarity). Chantal has a clear outcome for each meeting. ➤ She needs to ask clear questions. ➤ She needs to give clear instructions. ➤ She needs to listen carefully to understand. ➤ She needs to offer clear solutions or reassurances. The only way she can deliver all this without panicking and speaking incessantly is to give her thoughts and ideas structure. That’s where preparation is key. ➤ focuses on what’s important – your message NOT your grammar. ➤ gives you the courage to keep developing your communication skills. Chantal left feeling reassured. She was no longer the ‘catastrophe’ (sic) in English. She was given permission to make grammar mistakes. More importantly, she discovered she was ‘good enough’ and that was empowering. The full immersion intensive course gave Chantal the much-needed healing time, break from her routine to reflect and boost to her confidence. It also gave her the coping strategies to manage her upcoming fact-finding conference calls with her team. But it’s only the start of the journey. What she needs now is to have a mentor or coach to guide her as she navigates her way to becoming a courageous and effective communicator in English. ➤ With whom she checks-in once a month for guidance and more coping strategies that she can implement. ➤ With whom she can communicate in between the monthly sessions with questions and observations of her experiences with her co-workers. ➤ With whom she can share her frustrations and get encouragement to keep going. ➤ To whom she can be accountable. The real journey of progress and achievement begins after an intensive course, preferably with a coach who is supportive, nurturing and empowering.